Ukraine-US: establishing the relations relying on the common interests, not on the crisis management – Центр "Нова Європа"
Report by Alyona Getmanchuk, Director of the NEC, on assessment of Ukraine’s progress in relations with the US for the quarterly magazine ТRUMAN Index. The full version of TRUMAN Index No. 5 (9) is available on the TRUMAN Agency website. Poroshenko was elected president, despite clear skepticism on the US side about the usefulness of such a bureaucratic format. And so this event had priority significance for the Ukrainian side. The Commission’s meeting also gave a clear picture of the current priorities in relations between the two countries. These became evident with the reformation of the Commission’s working groups and the clear prioritization of the work of three of them: security and countering Russia’s aggression, human rights and humanitarian issues, economy and energy. 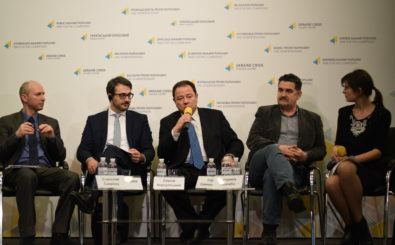 The second event was the crisis over the Kerch Strait caused when Russia opened an armed attack against Ukrainian naval vessels and took the crews prisoner. It ended up with President Trump cancelling a meeting with President Putin, arguing that the Russians were still not releasing the sailors and their ships. Still, at the time of press it was still not clear whether the cancellation of the meeting between the two constituted the US’s ultimate response to Russia’s aggression in the Black Sea or was just the first level of its response and that further action would follow beyond the correct political declarations. Also under question is what will win out in America’s response to the crisis: active engagement or shifting the issue to its European allies. Given the flurry of statements from various officials in the Trump Administration calling on them to take the lead in issues related to Ukraine, the impression is that the White House was prepared to “declare” Germany and other European countries responsible for any further escalation or the de facto annexation of the Azov Sea by Russia—just like Obama was “declared” responsible for the annexation of Crimea. Among other events, one of the more notable ones was the long-awaited visit of US Secretary of Energy Rick Perry. During his visit, the US official referred to Ukraine as the “Texas of Europe” in terms of its resource potential. Aside from NSA John Bolton on Independence Day in August, Perry’s visit represented the highest level of US government official not only during this last quarter but basically for the entire year. There is some symbolic value as well, given the importance of energy in bilateral relations. The United States has been quite actively opposing the construction of the Nord Stream II pipeline. However, its position has mostly just been verbalized, either through statements or resolutions issued by the House of Representatives that have largely been recommendatory in nature. Among the minuses during this quarter was the resignation of Secretary of Defense Gen. James Mattis, one of the strongest supporters of Ukraine among the top officials in the current US administration. Generally speaking, however sustained and effective the current version of the Strategic Partnership Commission might be, the main challenge in relations between Ukraine and the US is to build them on common interests and not on temporary crises. by the Ukrainian FM and the American SecState. More precisely, Pavlo Klimkin wrapped up the work of the Commission with a meeting and briefing with Mike Pompeo. The actual meeting of the working groups was chaired by Assistant Secretary of State for European and Eurasian Affairs Wess Mitchell. In a way, the relaunch of the Commission marked the 10th anniversary of the Charter on Strategic Partnership, which was signed in the last days of George W. Bush’s presidency, in December 2008 by Ukraine’s then-FM, Volodymyr Ohryzko, and SecState Condolleezza Rice as a kind of consolation prize for Ukraine’s unsuccessful application for the Membership Action Plan the previous April at the NATO Summit in Bucharest. first session with then SecState Hillary Clinton. Afterwards, there were only two more meetings, attended by Clinton and Ukraine’s next FM, Kostiantyn Hryshchenko. The last meeting of one of the most important working groups at that time, on political dialog and rule of law, took place at the State Department at the start of Viktor Yanukovych’s final year, in February 2013, which the author attended as an observer. It’s significant that the Commission has been restored under President Trump, although the decision was persistently—and unsuccessfully—promoted by the Poroshenko team during President Obama’s second term as well. The US side kept maintaining that Vice President Joe Biden’s ongoing handling of the Ukraine portfolio was far more significant than any formal commission. Under Trump, Ukraine’s negotiators were also initially told that dialog between the US and Ukraine was developed enough without such bureaucratic mechanisms. Washington typically uses such mechanisms with countries with whom relations are noticeably underdeveloped. Notably, the Ukrainian side was hoping to see the Commission restored at the level of the President of Ukraine and Vice-President of the US, along the lines of the Kuchma-Gore Commission. In the run-up to a presidential election in Ukraine, the inauguration of a “PoroshenkoPence Commission” would have been a more desirable diplomatic and PR outcome. However, at a certain point, Kyiv interpreted the signals from Washington as indicating that, unlike his predecessor, Pence had priorities other than foreign policy. So the ministerial level became a kind of compromise although hope remains in Kyiv that the level might eventually be raised. Aside from the PR effect, why has rebooting the Commission been such a big deal for Kyiv? Our sources in Kyiv say that firstly it’s in order to ensure regular closed-door dialog with Washington and the opportunity to discuss the most critical issues face-to-face. In short, instead of exchanging statements or “deep concern” in public, better to discuss everything privately within the designated working group. together around specific commitments, including in the form of related assignments after every working group session. Stable, predictable dialog with Washington is especially important at a time when President Trump engages in twitter diplomacy. The Strategic Partnership Commission is a kind of test for whether traditional, bureaucratic diplomatic formats stand a chance in the context of such untraditional formats, especially in relations with the US. Practice has shown that dialog with President Trump at the highest level between Kyiv and Washington on principle cannot be predictable or systematic. Only coordination and constant contact at other levels is capable of maintaining Ukraine-US relations in good shape. With Ukraine heading into elections, it’s especially important that this bilateral dialog is carried on not just by political appointees but also those who carry the institutional memory of various agencies. of the bicameral Ukraine caucus who were up for election returned, except for Democrats Joe Donnelly and Bill Nelson, and Congressmen Pete Roskam (R) and Joseph Crowley (D). Andy Levin replaced the cochair of the Congressional Ukraine caucus when his father, Sandy Levin, 87, decided not to run. The one development that probably worried Kyiv most of all was the decision of Bob Corker, chair of the Senate foreign relations committee, not to run. He will most likely be replaced by Senator James Risch, who is seen among Ukrainian diplomats as largely supporting the country. Still, US analysts who follow the Russia portfolio say that he is more inclined towards dialog with Russia, giving as an example his participation in the controversial Senate delegation that visited Moscow last July. of the working groups and the clear priorities designated to three of them: security and countering Russia’s aggression, human rights and humanitarian issues, and economy and energy. All of these issues were reflected at length in the joint statement issued by the Commission. Moreover, these are the issues that regularly came up in bilateral dialog in recent months. This latest quarter finally saw US Energy Secretary Rick Perry visit Kyiv. Other than the visits of Mike Pompeo while he still headed the CIA and NSA John Bolton, who came for the Independence Day ceremonies, this was probably the most high-level visit of a member of the US Government to Ukraine for 2018. Perry was supposed to visit back in 2017, but had to change his schedule. In addition to Ukraine, he visited a number of other CEE countries. His regional tour could well have been subtitled: “For energy diversification, against Nord Stream II.” Perry’s time in Kyiv will be most remembered for his statement that Ukraine’s resource potential means it could become “Europe’s Texas,” and came at a time when Ukraine was expanding active efforts with Westinghouse to diversify nuclear fuel deliveries to Ukraine—American nuclear fuel has already replaced Russian fuel on 6 of the country’s 15 AESs—and to increase the capacities of domestic power units. A joint project is also currently underway between EnergoAtom and Holtec to construct a centralized storage facility for spent fuel rods. With Nord Stream II, statements strongly condemning the construction of Russia’s pipeline have echoed at all levels of the US government On December 11, the Congress passed a strongly-worded resolution criticizing the project and calling for new sanctions. Assistant Secretary for the Bureau of Energy Resources (ENR) Francis Fannon noted that nearly 10 bills are waiting for consideration in the Congress that are aimed against Russia’s energy sector. However, the fact remains that more than 200 kilometers of the pipeline have already been laid and opposition to the project continues to mostly be all talk and no action. The number of statements criticizing the gas pipeline has grown substantially since Russia’s attack on Ukrainian ships in the Black Sea. Calls on European partners to reconsider the building of Nord Stream II have been coming from all levels of the US government. issued three statements of concern over the course of the year about the situation in the Azov, in May, August and November. The American delegation also raised the issue at the OSCE Permanent Council. Ukraine’s partners, who sent out signals urging that it be lifted within the 30-day term established. came from US Ambassador to the UN Nikki Haley. serious escalation against Ukraine directly involving Russian military forces since Trump came to office. The White House had a chance to demonstrate how his actions differ from those of his predecessor, whom Trump accuses of de facto losing Crimea to Russia. situation demonstrates that, at least in some circumstances, Trump does actually listen to his advisors. meeting would have been. Since Helsinki, there is good reason to believe that during a one-on-one meeting with the Russian leader, Trump would have been unable to defend the US position as strongly as he could in Twitter. Of course, it’s also worth remembering that the politics of public ultimatums doesn’t work with the current Russian regime and one tweet isn’t nearly enough to get Russia to return Ukraine’s vessels and their crews. Nor is this enough of a step to get the Russian Federation to stop its tactics in the Black Sea region, where Putin is clearly attempting a creeping annexation of the Azov Sea, similar to the way that he occupied Crimea. The ultimate question remains whether cancelling the meeting in Buenos Aires was Trump’s entire response to Russia’s aggression or just the first shot across the bow. At the time of publication, various options for restraining Russia in the Kerch Strait were actively discussed but even a month after the incident, nothing had happened. The only positive news on the practical level was that the State Department announced at the end of December that it was allocating US $10 million to assist Ukraine in improving the capacities of its navy in response to Russia’s aggression in the Black Sea. So far, there have not been any further details as to what exactly this funding would go towards. TRUMAN Indexes had raised as a possibility. This was the second disappointing resignation after UN Ambassador Nikki Haley’s. Mattis was one of the greatest allies of Ukraine among the current administration’s top officials and the one who understood, possibly better than all the rest, just what a threat Russia represented and the importance of an effective response to such threats. So far, the US reaction to the crisis over the Azov Sea is most notable for the constant references to the fact that America’s European partners have to take the lead on this issue. One State Department official said “off record” at an agency briefing, “Our European partners have to answer for what is going on in their own backyard.” If the notion that the Ukraine crisis should be delegated to European partners continues to gain force, the question arises: how does Donald Trump differ from Barack Obama, who effectively handed the Ukraine question off to German Chancellor Angela Merkel. The impression all the statements and accusations from the Trump Administration regarding the need for Europe to take the lead on the Ukraine situation make is that the White House is preparing to declare Germany and other EU countries “responsible” for any further escalation or the effective occupation of the Azov Sea by Russia—just like President Obama was declared “responsible” for the takeover of Crimea. Shifting the burden of the Ukraine issue to its European partners does not suit Kyiv or Ukrainian society as a whole. A national poll taken for the New Europe Center by the Democratic Initiatives Fund showed that Ukrainians expect the United States to take the lead as the guarantor of security, to launch new sanctions against the RF, and to support Ukraine’s accession to NATO. Incidentally, this last point is contained in the joint statement of the Strategic Partnership Commission. This contrasts sharply with the responses of those polled to potential assistance from the EU. Here, most Ukrainians expect the European Union to pressure their government on reforms more than anything. In terms of the situation in the Donbas, the main issue in Ukraine-US relations was the extension of the Law on the special status of certain counties of Donetsk and Luhansk Oblasts, which the US actively promoted in order to avoid having Ukraine accused of not implementing Minsk. The holding of illegal “elections” in ORDiLO was condemned by the American and European parties to the Normandy format. The question of a peacekeeping mission to the occupied territories and other aspects of a resolution were tabled for the time being. According to sources, Special Representative Kurt Volker attempted to maintain contact with his Russian vis-à-vis in order to figure out what could be done about the situation before the elections even took place. It’s also confirmed that he sent Vladislav Surkov a letter to this effect with a request to meet. However, based on Volker’s later comments, the meeting was cancelled in the wake of the Black Sea attack. Meanwhile, one influential Ukrainian diplomat says that the US position in terms of resolving the situation in the Donbas is inspiring: in all the key points it coincides with the Ukrainian position. This quarter was a decisive point in a process that began long ago, but yielded the most only in the last few months. At the local level, 21 US states had recognized the Holodomor as genocide against the Ukrainian people by the end of 2018. Typically this kind of recognition takes the form of a proclamation by the governor of a state or the mayor of a city. It also includes the declaring of a certain day or month or year to mark the anniversary. What’s significant here is that some states declared all of 2018 as a year to commemorate the victims of this genocide against the Ukrainian people. Finally, the necessary resolution was passed in the US Senate and House of Representatives. In the resolution, both chambers of Congress acknowledged the conclusions of the Commission on the Famine in Ukraine: Stalin and his circle had organized genocide against the people of Ukraine in 1932-33. This happened despite a certain amount of undermining activities, probably instigated by Russia, that ranged from accusing Ukraine of anti-Semitism—taking advantage of members of Congress with obvious intention of turning them against Ukraine and against recognizing the Holodomor—to a campaign of prank calls in the name of Ukrainian Ambassador to the US Valeriy Chaly to governors and mayors to remove the recognition of the Holodomor as genocide against the Ukrainian people from their agendas. Fortunately, these plans were exposed quickly enough and recognizing the Holodomor finally entered the mainstream of US politics at both the federal and local levels. Subscribe to the news of New Europe Center and find out everything first! Subscribe to our newsletter, so you do not miss anything!